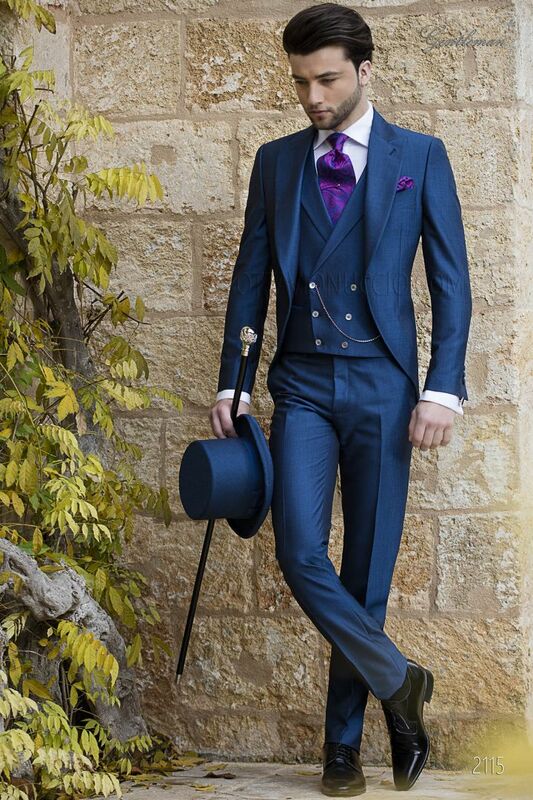 Short-tailed formal groom suit in electric blue wool blend. Single matching fabric covered button closure. Peak lapel. 3... Short-tailed formal groom suit in electric blue wool blend. Single matching fabric covered button closure. Peak lapel. 3 covered buttons and angled buttonholes at cuffs; single vent at back. This model has Redingote-style seams on the back to better stylize the figure and the length of this jacket is properly suitable for grooms only. Chaleco cruzado con solapa de pico azul royal en tejido mixto lana mohair alpaca. 6 botonoes madre perla, 2 bolsillos co... Chaleco cruzado con solapa de pico azul royal en tejido mixto lana mohair alpaca. 6 botonoes madre perla, 2 bolsillos con doble vivo y forro con goma interna para regular la cintura. Cravat and handkerchief set made from fuchsia and blue jacquard silk paisley pattern. Handmade. Sombrero de copa en tejido azul royal mixto lana mohair alpaca.